… we are sitting on the mother of all bubbles. Many, probably most, Americans anticipate a stream of consumption that will be provided for them into old age by the government (i.e., other taxpayers). Unfortunately, most American taxpayers do not anticipate the kind of enormous increase in taxes that would be required to pay for this stream of benefits. One or both of these expectations will not be met. Americans as a whole are simply less wealthy, in the most useful sense of rationally anticipatable future material consumption, than they think they are. And the size of this disconnect is vastly greater than, for example, the size of the housing-price bubble that just popped. 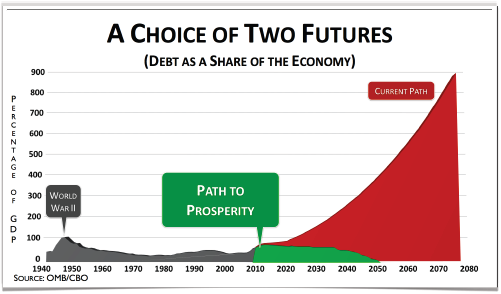 …the combination of the debt we have just put on our balance sheet, plus the deficits that are scheduled to be created by these programs over the next 10 to 20 years, means that we need to confront this problem soon. We have increased public debt from about 40 percent of GDP in 2005 to about 70 percent of GDP by the end of this year; and we are projected to exceed the historical peak debt of about 100 percent of GDP (achieved at the close of World War II) within the next 15 years; thereupon we enter uncharted territory. The GOP budget proposal makes clear that “the last Congress” — you know, the one dominated by Democrats — was responsible for the pork-laden stimulus bill. At a time when the free-market foundations of the American economy were in desperate need of restoration and repair, the last Congress took actions that further undermined them. The President and his party’s leaders embarked on a stimulus spending spree that added hundreds of billions of dollars to the debt, yet failed to deliver on its promises to create jobs. Acute economic hardship was exploited to enact unprecedented expansions of government power. This did not sit well with the American people. Citizens stood up and demanded that their leaders reacquaint themselves with America’s founding ideals of liberty, limited government, and equality under the rule of law. In recent years, both political parties have squandered the public’s trust. The American people ended a unified Republican majority in 2006, just as they ended a unified Democratic majority last fall. Americans reject leaders who focus on the pursuit of power at the expense of principle. They reject empty promises from a government that cannot live within its means. They deserve the truth about the nation’s fiscal and economic challenges. They deserve – and demand – honest leaders willing to stand for solutions. The GOP has a lot of profligate spending to answer for, but at least the party now is putting forth a serious plan, albeit one that will not survive President Obama’s veto power. The question is whether we can get Obama voted out of office before our Chinese creditors cut off the flow of money.